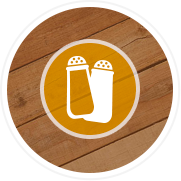 Dooger’s Seafood & Grill is the obvious choice for quality Seafood on the North Oregon Coast. We have locations in Seaside, and Warrenton Oregon. Our menu includes everything from clam chowder, salmon, lobster, calamari, oysters, as well as traditional american faire like burgers, steaks, and pastas. We strive to maintain a relaxed atmosphere while serving the freshest and finest seafood to be found. 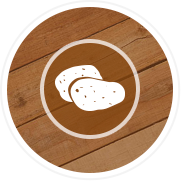 Our clam chowder is critically acclaimed, and you can now enjoy it in the comfort of your own home! Throwing a party, tailgating, need to impress the In-laws? 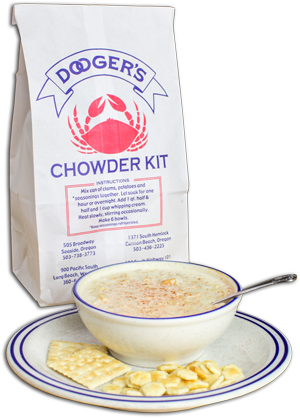 Dooger’s Clam Chowder is the perfect solution! Our Clam Chowder Kit includes everything you need to look like a culinary genius. 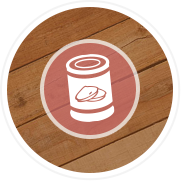 We supply the can of clams, the potatoes, and the double super secret seasonings. All you do is mix the ingredients and add one quart of half& half, and one cup heavy (whipping) cream and VOILA!!! Dooger’s Clam Chowder! A 52 oz. can of chopped sea clams. 5 1/2 oz bag of dried potatoes. Each kit is $18 and makes 6 large bowls of chowder. Shipping and handling for 1-2 kits is $15.00 anywhere in the United States. Shipping and handling for 3 kits is $20 and 4 kits is for $30. 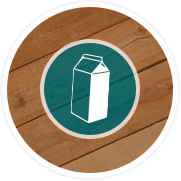 If you would like to order in larger quantities, please get in touch with us here.